Ukash is a voucher-based payment system which originated from the United Kingdom. It enjoys a remarkable popularity not only in the UK, but also in numerous countries around the globe. Relying on a prepaid system, Ukash is quite simple to use. Users can purchase vouchers using actual money. Each ticket contains a unique 19-digit code which represents the amount stored online in the Ukash system. When using this payment system, users just have to provide the unique code and the transaction will be processed. Of course, it is important to keep this code in secret to avoid losing money because of scams and frauds. Moreover, Ukash brings everyone an advantageous and feature-packed payment service, making it an ideal payment option for online industries, particularly online casinos like CasinoLuck. Ukash has become a popular banking choice for players since it is convenient to use and it allows instant financial transactions. Players can fund their account in a flash without any transaction fees. They just have to select ‘Ukash’ as their payment option. Then they will be asked to enter required details like the Ukash number and Ukash Value. Once done, the request is processed promptly and the deposit is credited to the gaming account automatically. Among the many benefits of using CasinoLuck Ukash is its confidentiality feature. Players don’t have to provide their personal or even financial credentials just make a transaction. In addition, Ukash vouchers are available in hundreds of outlets and even online, so players can easily purchase one. What’s even better is that it is available in several denominations and can be split into smaller values which actually help players to manage their bankroll. A minimum of €10 and a maximum of €250 serves as the transaction limit when using this particular mode of payment. Of course, it is also important to take note that this payment option cannot be used as a withdrawal method and players who have used Ukash to make a deposit will receive their winnings through a bank transfer. 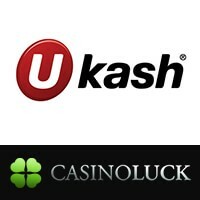 With Ukash being supported at CasinoLuck, players will enjoy instant, easy, and safe payment transactions. There’s no need to worry about topping up their bankroll, so they can focus completely on enjoying the CasinoLuck games, increasing their payouts, and of course—winning!